OK, this series had me shouting at the screen at points – some of it struck me as mad, bad and dangerous; but that could well just be my lack of understanding beyond mainstream medicine. At other points, I was thinking ‘Wow! that’s a good idea – I’ll try that’. So, if you’re open to alternative medicines and self reliance, buy it. It is a fascinating series to watch. “This series shows how we can treat everyday ailments using remedies based on freely available plants and remedies. It’s extremely accessible and shows exactly how to prepare home treatments, often at a fraction of the cost of commercial lotions and creams. 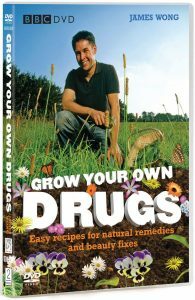 (There’s no grow-your-own recreational drugs involved! This is all strictly medicinal). The are six episodes of 30 minutes each, with a different focus each time; trees, herbs, flowers, vegetables, roots and fruit. Each programme follows the same pattern of explaining how many medicines have always been developed from the natural world, and how we can extract the important active ingredients from many plants to make our own remedies.